We’d love your help. Let us know what’s wrong with this preview of Never Let Go by Mac Owen. Mac and Mary are in high school when they fall in love in the 70s. Knowing the disapproval and shame a teenage pregnancy will bring, they keep it a secret from their church and from most of their family and friends, and make the heartbreaking decision to give up their baby for adoption. Eventually they marry and begin their life together, but before long fun-loving Mac isn Mac and Mary are in high school when they fall in love in the 70s. Knowing the disapproval and shame a teenage pregnancy will bring, they keep it a secret from their church and from most of their family and friends, and make the heartbreaking decision to give up their baby for adoption. Eventually they marry and begin their life together, but before long fun-loving Mac isn’t just a guy looking for a good time…he’s a meth addict. God has a plan, however, and His timing is perfect. When Mac wakes up to the mess he’s made of their young family’s life, the couple seeks solace in their church and in recovery, beginning a miraculous journey that neither of them could have imagined. To ask other readers questions about Never Let Go, please sign up. This was a heartwarming book about God's love & hope. I enjoyed reading about the lives of Mac and Mary Owen and their children, along with all the others who touched their lives. There were several moments in the book where I was reminded of how perfect God's timing is and how we don't always realize the purpose some people have in our lives until later. I would recommend this book to anyone looking for a light read about a couple who overcomes adversity through prayer and the power of God This was a heartwarming book about God's love & hope. I enjoyed reading about the lives of Mac and Mary Owen and their children, along with all the others who touched their lives. There were several moments in the book where I was reminded of how perfect God's timing is and how we don't always realize the purpose some people have in our lives until later. I would recommend this book to anyone looking for a light read about a couple who overcomes adversity through prayer and the power of God & use that to help others! I will be looking more into Celebrate Recovery! What can I say? I'm a sucker for true stories with happy endings. Mac and Mary Owen lived a life that could have inspired any of a number of made-for-TV movies where the pregnant girlfriend agonizes over the decision to give a baby up for adoption or the meth-addicted husband ends up going to rehab, but no made-for-TV movie could ever be as inspiring as the true story of the Owens and the restoration that God worked in their lives. The Owens now work with Celebrate Recovery, a ministry dedicated to helping those needing God's forgiveness and deliverance from ad Mac and Mary Owen lived a life that could have inspired any of a number of made-for-TV movies where the pregnant girlfriend agonizes over the decision to give a baby up for adoption or the meth-addicted husband ends up going to rehab, but no made-for-TV movie could ever be as inspiring as the true story of the Owens and the restoration that God worked in their lives. The Owens now work with Celebrate Recovery, a ministry dedicated to helping those needing God's forgiveness and deliverance from addictions. Never Let Go tells the story of the years leading up to their starting and working in a church 12-step program, their work helping others, and the eventual switchover to the Celebrate Recovery program after attending a Celebration Recovery summit. From the time Mac and Mary met in high school, there was an attraction between the two. Their attraction grew and love bloomed. An unexpected pregnancy led to their first born child being adopted and years of wondering how their baby was doing. Mac's love of Mary didn't keep him from smoking weed and eventually trying meth. But it Mac's encounter with God after their youngest daughter asked why "Daddy doesn't do anything with us anymore" when life began to change for the Owens and Mary's answered prayers showed the faithfulness of a loving God. 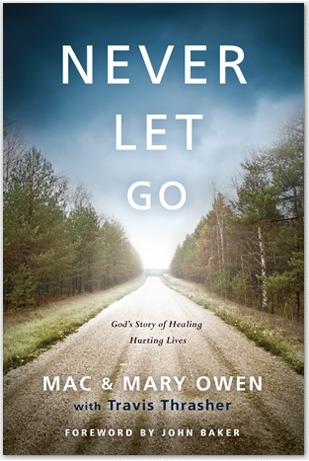 This is a very emotional book… in the context that you are allowed to walk through the valleys and peaks with Mac and Mary Owen as they share their life story. Mr. Thrasher was able to relay their life into a truly riveting story and made you feel like you were right there with them. I would highly recommend this book to everyone, but especially for those that have found themselves in the low point of their lives and are looking to a way to turn it around. Thank you to Mac and Mary for sharing the This is a very emotional book… in the context that you are allowed to walk through the valleys and peaks with Mac and Mary Owen as they share their life story. Mr. Thrasher was able to relay their life into a truly riveting story and made you feel like you were right there with them. Thank you to Mac and Mary for sharing their story!! I received this book from The Book Club Network in exchange for my honest opinion. As another reader put it "this is an emotional book", but it is one that has a great lesson for all of us. The book helped give me insight to the program Celebrate Recovery -- and how all of us have "Hurts, Hangups and Habits", they might not be like what Mac and Mary Owen went thru -- but we all have them!!!! Very good book, and worth every moment I spent reading it. Enjoyed this book - quick read but good testimony of a married couple fighting addiction and coming to freedom in Christ. It tells their story without graphic detail and foul language which I appreciated. Awesome book and life story from an awesome God changed couple ! Very touching and great story about life and its obstacles but also all the precious gifts of life and how God works in mysterious ways.